After many months of arguments and disputes Tottenham Hotspur were given the go ahead to start work on their £750m spaceship stadium that will replace the historic, 116-year-old, White Hart Lane. The development is planned for opening at the start of the 2018-19 season and will include a 61,000 capacity stadium and a complete redevelopment of the surrounding area, including a Sainsbury’s, a school and the erection of 275 new homes. Unfortunately, the developments have come at the expense of 72 local businesses, the last of them being Archway Sheet Metal Works, who now have to relocate. Those local businesses that haven’t been pushed out by the development look likely to be bypassed by its completion. The developments of the High Road will create a direct channel between the tube station and the stadium, enabling planners to lure matchgoers directly into their businesses before and after the match. The multi-purpose stadium is in full swing, they are here to stay. We must say goodbye to the stadium that lives among archaic terraced housing. Developers vow to offer the ‘match day experience’, however, the real experience of being a football supporter is one that develops in your mind through years of defeats and harsh weather conditions. The match day experience can’t be fabricated or manufactured; it’s a natural and invariably painfull process. I want discomfort, I want to be rained on, and I want beer served to people underage. I want safety conditions being slightly breached. What I do not want is a pre-match Sainsbury’s meal deal. Over the last century the game has changed, for better or for worse. 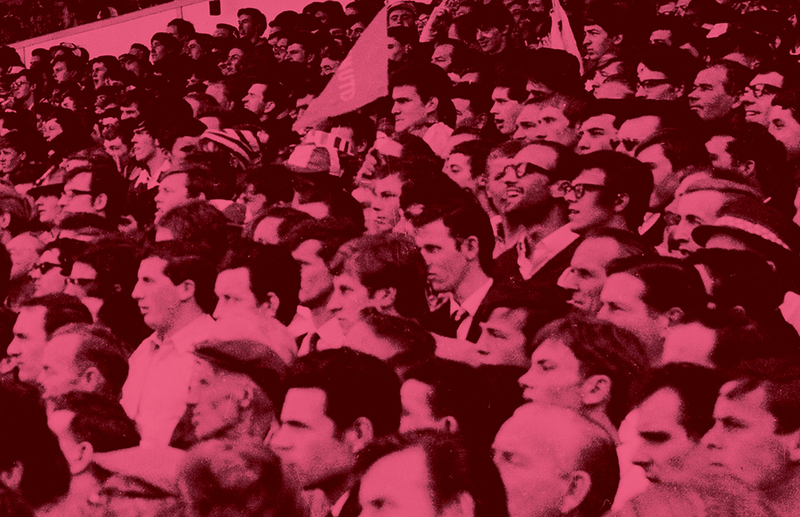 We are now entering a pivotal era for English football culture. There’s a set of fans accustomed to the modern perfections of the game who have known nothing else. Then there’s the rest of us, who acknowledge these perfections, but miss the beautiful imperfections of the game we grew up with. Once White Hart Lane is gone, future Spurs fans might never know the beautiful imperfect perfection that is the traditional English football stadium: industrial and intensely romantic shed structures that tower above our towns and cities. To understand the changing role of the British football stadium and the position it plays in our hearts we must travel back to Glasgow, in 1899. Queen Vic was our Empress, technology and industry were booming and football was the growing escape of the working man. In March of ’99, a factory architect named Archibald Leitch received a phone call from a new client. The phone call was from Rangers football club. Due to the growing interest in professional football, Rangers commissioned Archie to build and design Ibrox Park – the largest and first purpose-built stadium the world had ever known. Leitch obliged and built Ibrox free of charge, though not without some initial teething issues. Archie’s Ibrox was first used and first tested in a game between Scotland and England in April 1902. The game ended in disaster after a section of terracing had collapsed under the weight of spectators. There were 26 fatalities and 516 injuries. The collapse was put down to the incompetence of the timber merchant, Alexander McDougall, who chose to use weaker yellow pine instead of the proposed red pine to build the terracing. An enquiry never took place, as disasters like this were highly common in 1902. The disaster plagued the mind of Leitch throughout his career and bestowing influence on his future designs. Following the disaster, Leitch’s stadiums were made of concrete and reinforced steel, built with safety in mind. Leitch was a pioneer and an innovator who possessed a cool demeanour and a sharp wit. His background in factory building created a natural influence on his stadium architecture which is why a lot of English stadiums looked so industrial. Leitch’s patented crush barriers were used throughout English football stadia until the Taylor Report and the removal of terracing in 1989 following the Hillsborough disaster. Leitch was the first architect to deliver terracing that considered the view of the spectator. Prior to Leitch, spectators viewed the game from grass mounds next to the pitch, which when wet made maintaining a standing position difficult. His pedmented gable-ended grandstands and steel lattice work are features that became iconic of the matchday experience. The industrial, imposing style of the English stadium that we think of when we think of bitter night matches and away days are the work of Archibald Leitch. If we look at the European grounds in Spain and Italy, they are no match for the purpose built, safety and spectator orientated grounds of Leitch. Archibald Leitch was responsible for at least 46 individual stands and terraces in England and Scotland, from Bramall Lane to Hillsborough, Goodison to Roker, Craven Cottage to Stamford Bridge, Anfield to Old Trafford. Most of Leitch’s work was demolished or refurbished following the change from terracing to all-seater stadiums, despite a dozen of his designs still remaining in some way or another. His most notable work is perhaps on Craven Cottage, the small and quaint ground that is the home of Fulham football club. The later named Johnny Haynes stand and the Cottage pavilion on Stevenage Road are now grade two listed buildings. The only ground in Great Britain still to feature a separate pavilion for the players’ dressing rooms, Craven Cottage, is a testament to the work of Leitch and the ingenuity to manufacture his way around a problem. It’s because of Craven Cottage’s inability to expand that we are left with a great example of Leitch’s work. Unlike Leitch’s Trinity Road stand at Villa Park (the first stand to feature dressing rooms, electricity, and hospitality areas), and South Stand at Ibrox, Fulham’s positioning prevented Archie from building the luxurious grandstands he would become known for. Archie’s stadiums were built for football and stood as a symbol of the booming British industry and prosperity of the time. His stadiums were the focal point of their towns and cities yet they still belonged to the fans. Tottenham’s new stadium was built with more than football in mind. New stadiums now need justification, and with justification comes the onus to build a futuristic metropolis where every need is met. These stadiums are purpose-built for investment and profit, and will only distance the fan further from the club. Archie was a pioneer, a factory architect at heart. His stadiums were completely different to anything football had seen before. These new stadiums are just another phase in the broader landscape of English football. Maybe it’s our nostalgia for the old that makes us sceptical about the new. Sadly, maybe we should embrace the multi-purpose ‘stadia’ and leave the stadiums of our youth behind. It’s not like we have a choice in the matter.